Yesterday we got a look at the first wristwatch that keeps time at over 13,000 feet (4,000 meters). We were in the captain’s office with Eric Tyler, a Rolex representative from Melbourne, Australia. Eric had taken the watch out of its brown-leather case and placed it on top of a chart of the New Britain Trench, and we had all leaned in to get a better look at the technical triumph. Eric passed the watch around the table. For a few seconds, it lay in the palm of my hand, heavy, silver, and gleaming—an elegant engineering solution to an ocean that is cold, dark, and churning with power. Early this afternoon, after three weeks on board the Mermaid Sapphire looking at the endless blue surface of Mother Ocean, I finally have the good fortune to go for a swim. 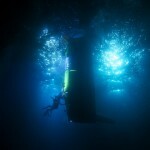 I mention to Rich Robles, who drives the dive boat, that I needed a close-up look at the ocean I’ve been writing about. Rich, a former Marine, drives me to a spot west of the vessel, points at the water, and says, “Get in.” Never was an order more gratefully accepted. I went over the side, adjusted my face mask, and took a long look around. I’m 12 miles (19 kilometers) south of New Britain Island, on the surface of a calm ocean. The seafloor is 13,000 feet (4,000 meters) beneath my feet. It’s just after noon, and the sun burns overhead. Below the surface, the water is a brilliant cathedral blue. I hold my breath and swim downward. Ten feet (three meters) under, the water is a few degrees cooler. I swim deeper, stop briefly, and gaze straight down. The brilliant blue shifts toward violet. 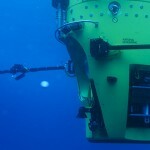 Scientists have divided the deep ocean into depth zones from the surface to the seafloor. They use scientific names like epipelagic, mesopelagic, and hadal. Concerned with measurements and data, they rarely mention that when you slip beneath the surface you pass an invisible line separating air from water, birds from plankton, and sunlight from darkness. Focused on physics and biology, they often forget to tell you that when you climb into a sub and descend to a depth of 13,000 feet, you confront the weight of the ages. Filed under Expedition Journal and tagged rolex.